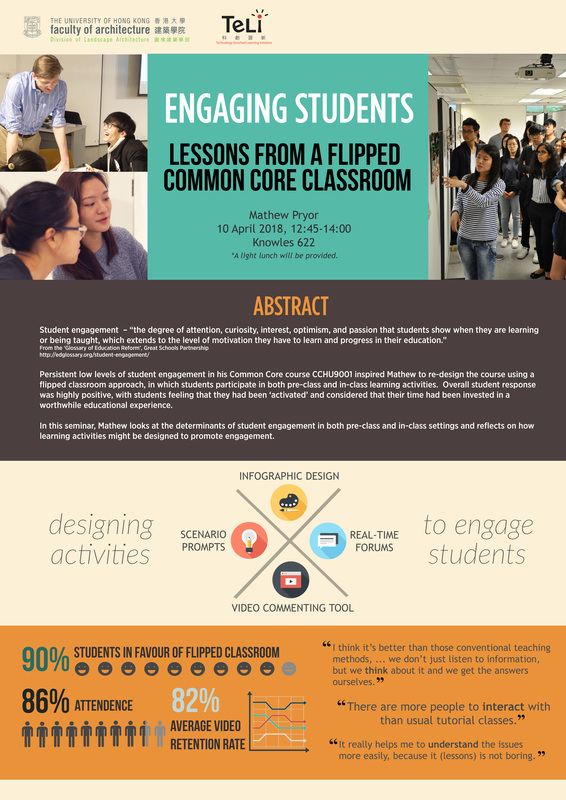 Persistent low levels of student engagement in his Common Core course CCHU9001 inspired Mathew to re-design the course using a flipped classroom approach, in which students participate in both pre-class and in-class learning activities. Overall student response was highly positive, with students feeling that they had been ‘activated’ and considered that their time had been invested in a worthwhile educational experience. In this seminar, Mathew looks at the determinants of student engagement in both pre-class and in-class settings and reflects on how learning activities might be designed to promote engagement. For enquiries, please direct your messages to enquiry@teli.hku.hk.